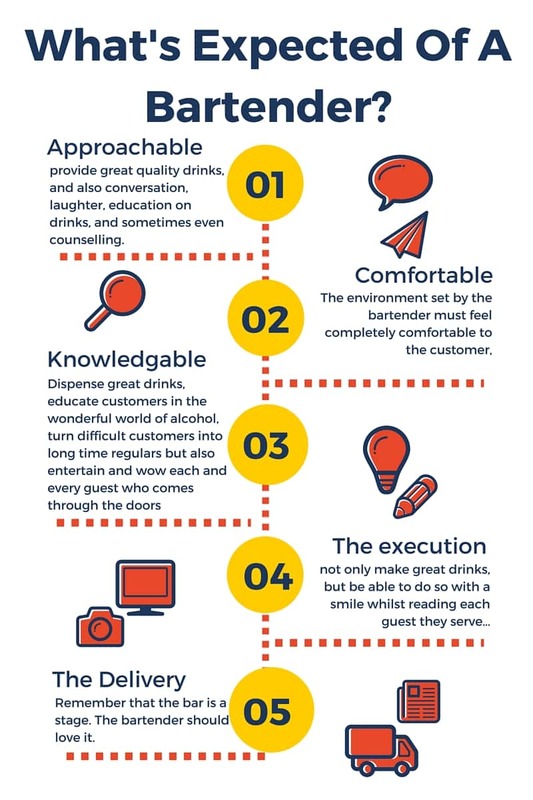 What's Expected of a Bartender? You are here: Home » Blog | Bartending Blog » Bartender Training » What’s Expected of a Bartender? 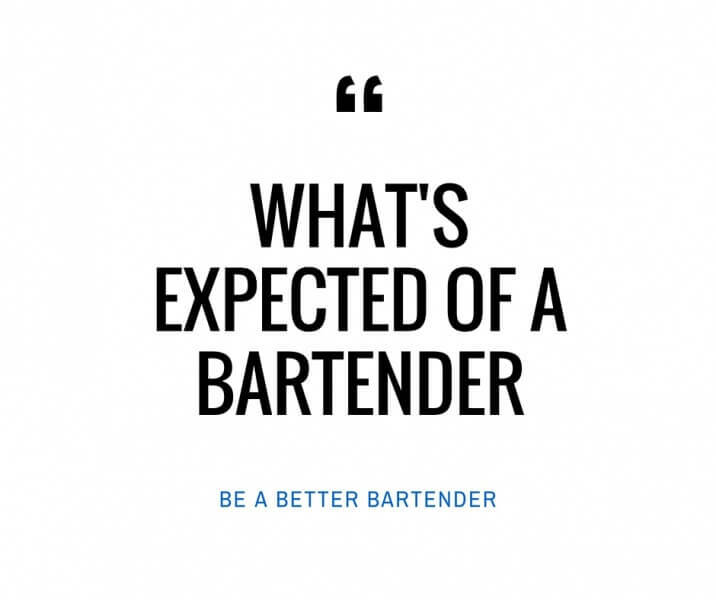 So What Exactly Is Expected of a Bartender? Imagine yourself in your favourite bar. What is it that makes it so good? The decor? the drinks? the music? Well it is probably a combination of a lot of little things that come together. When they do though, they create your perfect place to have a drink and socialise with people. You never can quite put your finger on why. You just feel more at home at that particular bar. Even over other similar places that your friends may say they enjoy more. The truth is that without the right type of bartender, who it is that that tends to the decor. Makes the drinks, and has power over the music. You would most likely hate that bar. What would happen if you went in one day and the bar staff had all been turned into vending machines? It just wouldn’t feel right to not have that human interaction. Don’t you agree? Believe it or not, most complaints aren’t about the products or the state of the toilets. They are about the human input, or most importantly the lack of it. Simply, if there is a bad bartender then the chances are it is perceived as a bad bar. We have all had an experience like this before surely? Just take a look at this “Gripe-O-Meter” which outlines exactly what complaints customers make when visiting a restaurant. Lets take a look at life working within a restaurant and then compare. In a restaurant the customer effectively rents the table from the proprietor. It is the waiter or waitresses role to simply provide a service to their guests whilst they are in the dining room. A key part is to be careful not to intrude into the guests’ space, whilst still providing a high level of service. If a waitress or waiter sits down at your table and starts telling you about your day, you are going to think that it’s odd right? But if the waiter or waitress doesn’t sit at your table you would never say that was odd, so that would go completely unnoticed by you in a restaurant. To ensure every customer has a fantastic experience. The bartender must ensure they provide everything that we just set out above for each and every customer. The environment set by the bartender must feel completely comfortable to the customer. Now that may mean having to clean up any unpleasant messes, ensuring toilets are kept to the highest standards (even on the busiest of holidays) and management having to deal with any unruly customers who may be impeding on the other guests’ experience. It is left to the bartender to not only dispense great drinks. Educate customers in the wonderful world of alcohol. Turn difficult customers into long time regulars and also entertain and wow each and every guest who comes through the doors. Do they just want a quick beer undisturbed? Are they unsure as to what to drink? Is this the first time they’ve tried a cocktail? What cocktail would they therefore enjoy? Are they seasoned drinkers who are looking for a different cocktail to experience their spirit of choice in? Or do they just want to sit at the bar and enjoy some light conversation with another human being? Remember that the bar is a stage. The bartender should love it. 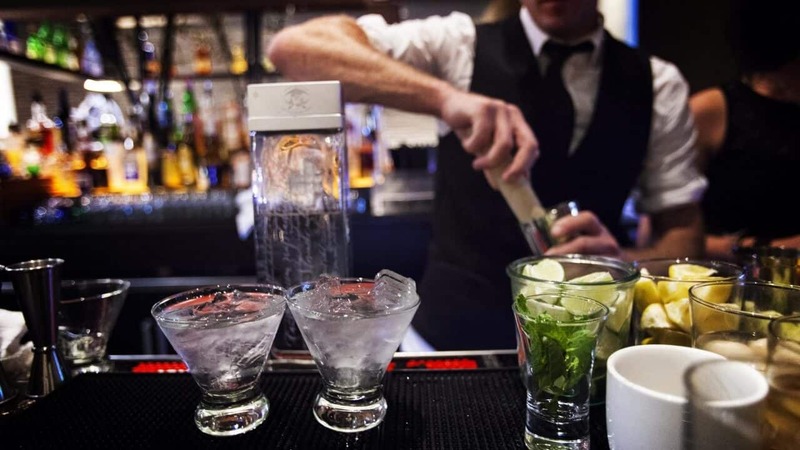 Bartending is not just a part time job – it is a profession. They need to represent themselves and the bar to the standards that they have been trusted with. Knowledge can be taught but passion for service cannot. Let us know if you agree with us in the comments? Is there anything else you would add? great article. Learnt a lot from this as a layman on the subject. Very good site you have here but I was curious if you knew of any community forums that cover the same topics discussed in this article? I’d really like to be a part of online community where I can get feedback from other knowledgeable people that share the same interest. If you have any suggestions, please let me know. Kudos! Thanks for reaching out. yeah sure we actually have one you’ll be happy to hear. Hi, glad you enjoyed it! I was using Feedburner but obviously this as disbanded, i will look further into it for you.